1 1/4″ to 2 1/2″ inches (3.2 to 6 cm). Rough green, brown or gray skin with several large dark blotches on the back, bright orange on underside of legs. Large toe pads. Trees and shrubs growing in or near permanent water. Southern Ontario and Maine to northern Florida, west to central Texas. Spiders and insects including flies, moths, leafhoppers, ants and caterpillars. Breeds from April to August. Up to 2000 eggs, laid singly or in small groups of 10 to 40, attached to submerged plants. Hatch within 5 days. Tadpoles metamorphose into froglets in 40 to 60 days. 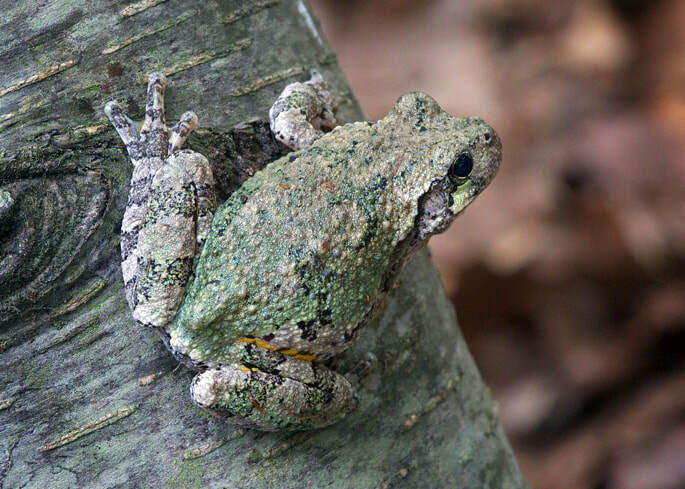 Stable populations exist throughout range, but water and air pollution are severely affecting frog populations throughout the country due to the frogs’ absorbent skin. They are considered an indicator species; meaning low numbers of frogs can indicate an unhealthy environment. 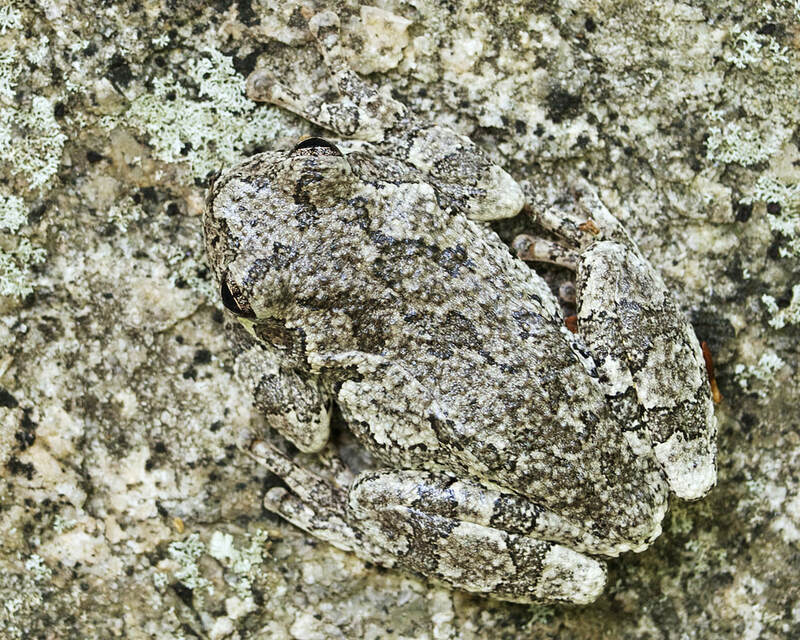 The Gray Tree Frog has flexible toes with large, sticky toe pads, making it an excellent climber. These frogs are usually walkers and climbers rather than jumpers. Mostly arboreal (tree-dwelling) they descend to the ground or water’s edge only during the breeding season. Their voice is a musical trill sounding similar to a flute or red-bellied woodpecker. They can often be heard calling on rainy summer evenings. 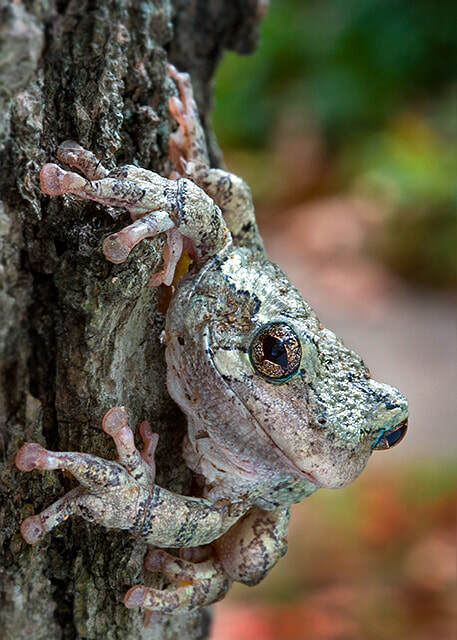 Connecticut’s Beardsley Zoo has one Gray Tree Frog on exhibit in the Connecticut reptile building located in our New England Farmyard area. We also have many living in the wild on Zoo grounds and we often hear them calling.